Connor Baxter and Sonni Hönscheid have claimed victories at the Mercedes-Benz SUP World Cup here in Germany today, overcoming an elite field and a rollercoaster of wild and beautiful weather to claim the overall wins at the seaside town of Scharbeutz. Connor sure did it the hard way though: After finishing runner-up to Casper Steinfath in yesterday’s sprints, the Starboard superstar once again had to settle for 2nd place today, with Michael Booth conquering this afternoon’s 10km ‘Super Lap’ course race. But with Casper slipping back to 4th today and Boothy having a shocker on Saturday, Connor snuck to the top of the overall event standings, and in doing so took home the lion’s share of the $25k prize purse. After the wild thunderstorms on Saturday afternoon, it was a beautiful sunny Sunday here on the north coast of Germany. There was a big crowned lined up along the pier to watch the main event go down, and the elite paddlers didn’t disappoint. With Paul “Jacko” Jackson’s excellent Super Lap format being used by the World Series crew once again (it debuted at the opening stop in Japan last month), the race became a battle of both skill and strategy. After a hectic start, a seven-man group (Boothy, Connor, Casper, Jake Jensen, Arthur Arutkin, Leo Nika, Bruno Hasulyo) opened up a gap on the rest of the field on the opening lap, before settling into a solid rhythm on the second of seven loops around the ~1.5km course. Stuck in the chase group were Davide Codotto, Daniel Hasulyo, Vinnicius Martins and Eric Terrien. By the third lap, with the leaders having twice skipped the Super Lap buoy (which allows paddlers to take a ~100 metre shortcut on one lap of their choosing), those of us watching from the pier could sense that someone was about to make a move. All eyes were on Boothy, who loves to break the field and get his own clean water (not to mention the fact he’s been showing some insane form lately), and sure enough he started telegraphing his intent as the shortcut buoy approached. After having led the race for much of the first two laps, Boothy and Jake deliberately drifted to the back of the lead draft train, sitting in the final two wagons as the Super Lap buoy approached. With Connor on the front of the train, the race suddenly became a game of cat and mouse. Connor skipped the buoy but slowed down and looked over his shoulder to see what the other boys were doing behind him. However with Leo, Casper and Bruno all choosing the same path as Connor, he was already committed to doing a full lap by the time Boothy made his move. Arthur, who was directly in front of the Aussie, responded immediately, while Jake, who was sitting on Boothy’s tail, followed as well. So all of a sudden a single draft train of seven paddlers was now two groups, one with four wagons (Connor, Leo, Casper and Bruno) and one with three (Boothy, Arthur and Jake). It was really exciting to watch the two groups sprint off in opposite directions as soon as the move was made, and it once again highlighted why the Super Lap concept is such a great idea. But the twists and turns kept coming: Just half a lap later, with the front three setting an awesome pace that looked certain to put them in the virtual lead, heartbreak struck for Jake Jensen, who had his paddle cut clean in half going around a buoy. With Jake sitting on the front of the three man group, Boothy accidentally clipped his compatriot’s paddle with the nose of his board, and because Jake had his blade tense in the water at that moment, the shaft was immediately shattered. 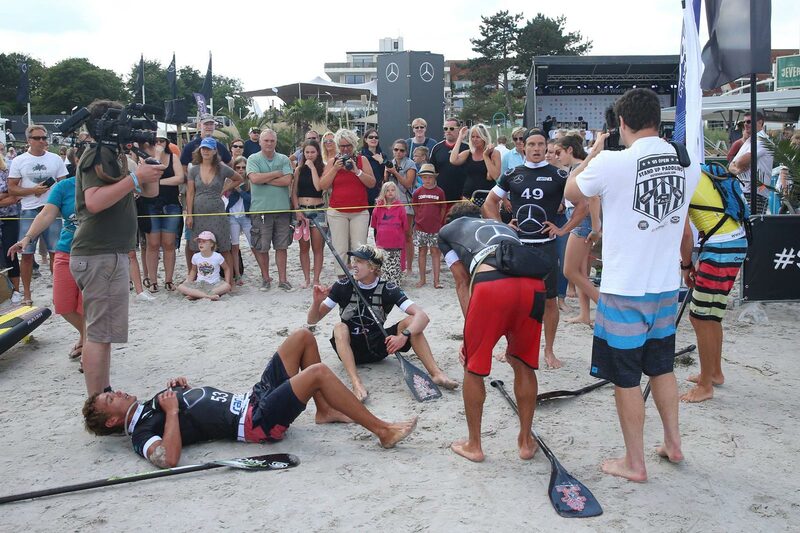 It was a freak accident, one that ended the Fanatic team rider’s promising race in an instant. The drama also caused Jake to fall off his board, which held up Boothy and Arthur for 5-10 seconds and eroded most of the good work they’d done after having taken their Super Lap. So as Jake prone paddled back to shore, Boothy and Arthur had to work as a two-man team to try and extend the lead over Connor’s group before those four boys took their own Super Lap. Connor knew better than to give Boothy his own space for too long, and sure enough, on the very next lap he led the chase group around the shortcut buoy, with the two breakaways only four or five board lengths in front. Over the next lap, Connor worked like an animal to close the gap, first dropping his own group and then reconnecting with the lead duo. This then put all the pressure on the Danish Viking, with Casper having to finish no more than one spot behind Connor to claim the overall event title. It was a see-sawing affair over the next few laps, but eventually Casper, Leo and Bruno hitched their wagons back onto the lead train, which left it as a six-man sprint over the final loop. After his disappointing finish on Saturday, Boothy turned his engine up to full power and surged clear to victory, with Connor and Arthur left in a sprint up the sand that the Hawaiian narrowly won. Behind them, Casper had to settle for 4th place, which bumped him down to second on the overall event leaderboard, while Leo was left swimming to shore after mis-judging when to jump off his board for the beach run. Bruno crossed about 15 seconds later to claim 6th place, just holding off a fast-finishing Vinnicius Martins, who in turn held back Bruno’s brother, Daniel. It was a great weekend for the Vinni, with the ever-smiling Brazilian securing 4th place overall for his JP Australia team — Vinni’s best ever result at a World Series event. While the women’s field was much smaller than the men’s, meaning the trains were a little shorter and the shortcut buoy a little less intense, the Super Lap format still played a pivotal role. With the distance race having been designated as the tie-breaker at this event, Fiona basically had to win today’s race to guarantee the overall event title, even though she’d already won the shorter race on Saturday. As expected, Sonni and Fiona broke the rest of the women on the opening lap, so the only question was who would take their Super Lap when. Fiona didn’t waste any time, taking the shortcut on the opening lap. That made the next hour an intriguing battle, as Sonni had to set her pace against a competitor that was 100 metres in front of her but virtually level in terms of the overall race. Fiona fought hard and maintained her lead at times, but Sonni’s superior strength was too much, with the German slowly but surely erasing the deficit. By the time Sonni took her own Super Lap on the penultimate loop, she instantly opened up a 50 metre gap on her young rival and maintained it all the way to the finish line. That gave Sonni the overall victory, which was rather fitting not only because Germany is her home country, but because as a Mercedes-Benz sponsored athlete, Sonni was basically the face of this event. It’s been a big summer for the SIC team rider, with Sonni’s victory here in Scharbeutz extending her big winning streak that began at OluKai two months ago. Though it was a cruel twist for Fiona, who usually does better in the distance races but who has lost the past two World Series races after they were weighted towards the sprints. Fiona flipped the script this weekend, but then the tie-breaker was flipped on her and she had to settle for an overall second once again. Coming in behind the top two was Susanne Lier, who turned the tables on Dutchwoman Emma Reijmerink from yesterday to claim the third and final step on the main podium; Local girl Noelani Sach rounded out the top five. It was a great weekend of racing here in Scharbeutz, with the local organising crew setting up a world class event in a perfect beach location, and the paddlers giving us a great show out on the water. And of course it’s absolutely fantastic to see a huge brand such as Mercedes investing heavily into a stand up paddling event. With the local organising group (the “ACT Agency”) currently negotiating a two year extension to the deal — it’s still pending but sounds positive — this event could have a massive future. 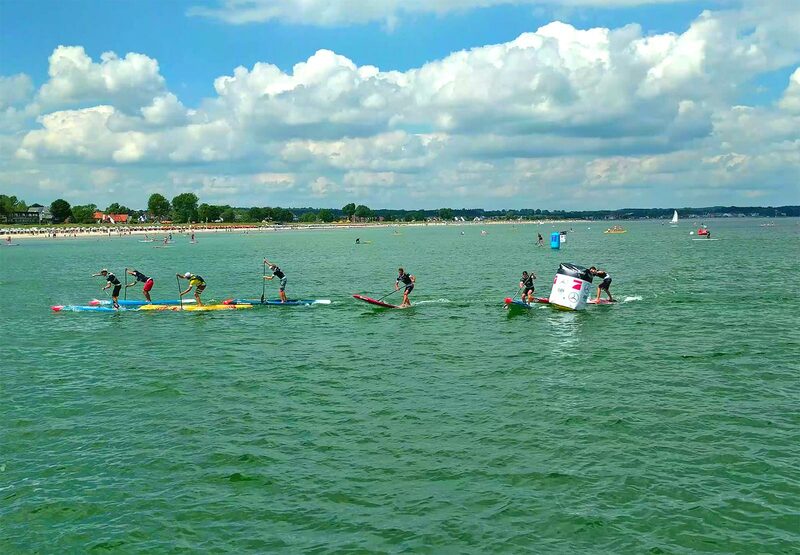 These guys already organise the biggest windsurfing and kitesurfing events in the world, and while the SUP World Cup has moved around a bit over the past few years, it seems to have found a great home here in Scharbeutz. Anyway, there will be some video of today’s festivities up later, but in the meantime here are the full results. 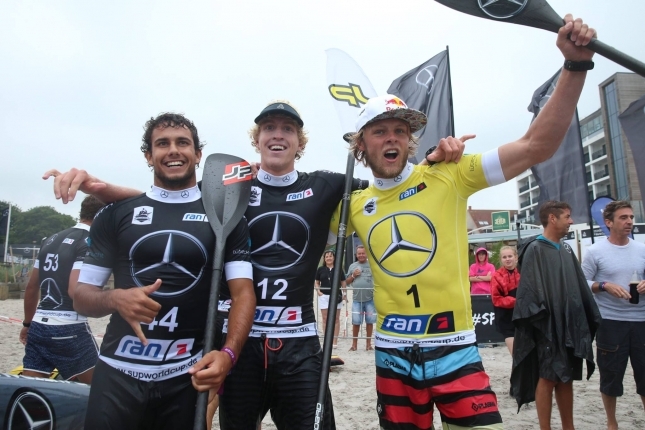 The Danish Viking has done it again, beating home a world class field to claim the sprints here on day 1 of the Mercedes-Benz SUP World Cup in Scharbeutz, Germany. The Naish team rider edged out Hawaiian Connor Baxter (Starboard) and Brazil’s Vinnicius Martins (JP Australia) in the eight-man final, repeating his heroics from Japan last month and setting himself up for another potential World Series event title. 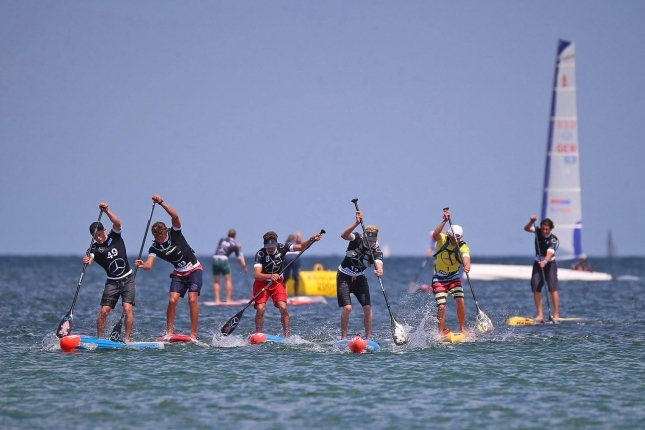 Tomorrow’s distance race will decide who gets crowned the 2016 SUP World Cup champion, and also who’ll walk away with the lion’s share of the $25,000 prize purse. With inclement weather and a stiff breeze making conditions tricky on the short, sharp, technical course, Casper sealed the deal with his trademark flying start, beating the field to the first buoy and never looking back. Connor fought all the way to the end, and will probably fancy his chances in tomorrow’s distance race, however today the Maui superstar had to settle for second. Vinni was incredibly impressive, coming back from what looked to be certain defeat not once but twice during the knockout stages of the sprint competition, before putting in a commanding performance in the final to set himself up for a big result overall. Just behind the top three was Hungary’s Bruno Hasulyo (Starboard), who seems to be getting better with every elite race he does. Coming home 5th was Fanatic team rider Arthur Arutkin, fresh off his triumphant performance for Team France at the EuroSUP event in Lacanau during the week. Arthur only arrived at the event last minute after a mammoth 18 hour drive from France, and had to battle through the repechage to claim his spot in the final. Also getting through to the final round were Davide Codotto (3 BAY) from Italy, Aussie Jake Jensen (Fanatic) and France’s original power paddler, Eric Terrien (BIC). The surprise result of the day came from Australia’s Michael Booth (Starboard), who once again got knocked out in the early rounds of the sprint event, mirroring his disappointing finish in Japan last month. Though if the past month has been any guide, Boothy will be giving everyone something to chase in tomorrow’s distance race. On the women’s side it was a two-horse race the whole way between Fiona Wylde (Starboard) and Sonni Honscheid (SIC), with the young American out-sprinting the home country hero in all three of the sprint rounds. Outside the top two, Dutch national champ Emma Reijmerink (Naish) snuck past Germany’s Susanne Lier (NSP) for the final spot on today’s podium, with local hero Noelani Sach (Naish) finishing 5th. 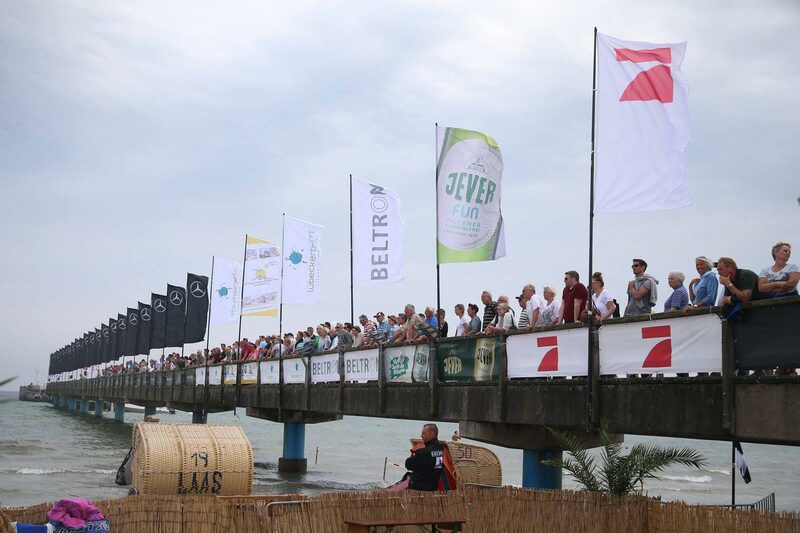 Despite the unpredictable weather today it was a fun day at the beach, with a world class setup here in Scharbeutz. The local organising agency has done an amazing job to pull together a big event, while it’s great to see a major brand such as Mercedes investing in the sport. 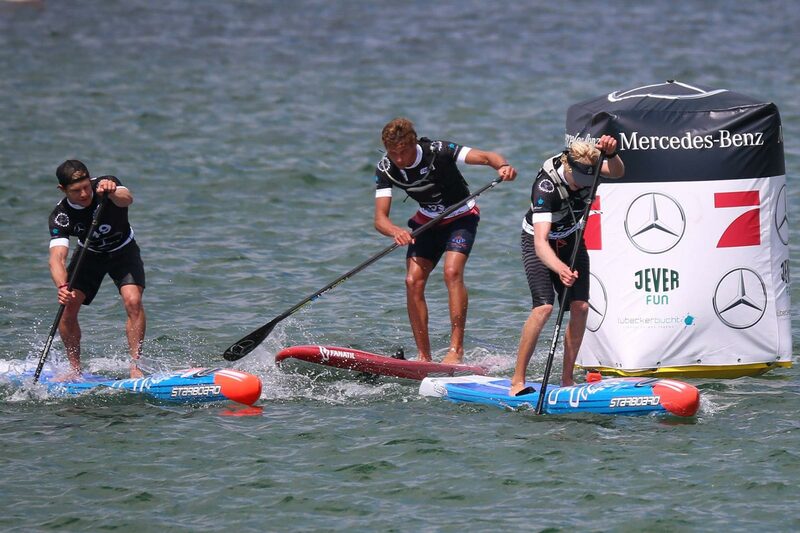 The Mercedes-Benz SUP World Cup wraps up tomorrow afternoon at 2pm local time, so check back Sunday evening for the overall results. In the meantime, here are the top finishers from today’s sprints.